Seirei no Moribito, Guardian of the Spirit (精霊の守り人) is licensed by Media Blasters and the R1 DVD is now available for order! Time flies by scarily fast! This is definitely on my wishlist along with other R1 releases such as Darker than Black and Ouran High School Host Club just to mention a few… *grits teeth* Saving and holding out for the Christmas sale! This series has a total of 26 episodes and the upcoming R1 release has 7 episodes on 2 DVDs (US$37.99) Kinda strange but it is at least 4 times cheaper than the R2 release which contains only 2 episodes per DVD (5800yen w/o tax). Considering this, I’m not expecting too great a package in terms of booklets or extras when it ships. 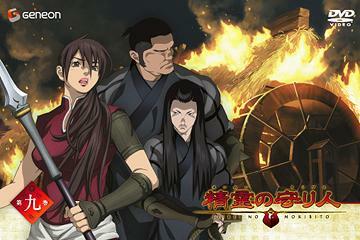 At first glance, I thought Seirei no Moribito was set in ancient China or Korea. The character designs looked fantastic to me as I tend to love this design style. It turns out that the anime has a supernatural / fantasy theme and was set in a fictional world. The first episode drew me into the interesting and suspenseful story and kept me guessing enough to want to know what was in store for the characters in the next episode. It is not the typical “the-chosen-one-saves-the-day-at-the-end” formula that we see so often in such fantasy-themed anime. Definitely refreshing. The main characters are believable and well-fleshed out. Most importantly, I cared about them. And I find that one of the strongest points that this anime has is the engaging and non-intrusive way it transported the viewer into the world that the protagonists live in. As I watched the characters try to solve the mysteries and overcome challenges thrust at them, I also enjoy learning about their culture and way-of-life. Although this may seem to slow down the main development of the story at some points, I feel that it added richness and depth to the whole experience. Coupled with fluid animation and action sequences, good voice acting and great soundtrack composed by Kawai Kenji (Fate/stay night, Death Note), this anime is a gem that you shouldn’t miss! At a time when the balance of nature still held the civilizations of mankind in thrall, a single drought could spell the end of a society and doom its inhabitants to piteous deaths. Accused of possession by an evil spirit suspected to bring calamity to the empire, Prince Chagum must be put to death by his own father’s hand. His salvation is in the form of Balsa, a spear woman and mercenary from Kanbal, the kingdom across the mountains. Her skills are legendary, and although reluctant, she is held by a mysterious vow to save eight souls before she dies. Can she fend off an entire empire and make Chagum her eighth soul?